17-digit Vehicle Identification Number (VIN) Please be aware that the VIN will be requested after placing the order! 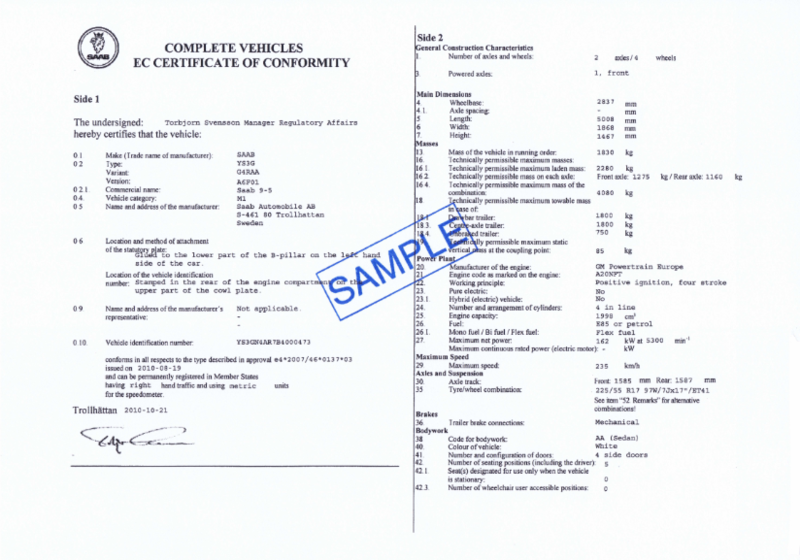 Certificates Of Conformity (COC’s) are only available for vehicles which are type approved according a European Whole Vehicle Type Approval (WVTA). Before ordering a Certificate Of Conformity (COC) and to determine the applicable price, please verify if the vehicle is covered by a European Whole Vehicle Type Approval (WVTA). WVTA vehicles are recognizable by the European Whole VehicleType Approval Number mentioned on the manufacturer’s plate/label. Please find more information in the section “COC Information” regarding European Whole Vehicle Type Approved models and to determine if for a vehicle a COC is available. Please do not order a COC if it is not available for the vehicle concerned. In case a COC order would still be placed, while it is upfront known that a COC is not available, a 90% refund is applicable according our Terms & Conditions. Consequently, 90% of the paid amount will be refunded under these avoidable circumstances. The Certificate Of Conformity (COC) will be provided in the English language only. According EU legislation, the Certificate of Conformity does not have to be issued in a designated language (i.e. any official language of the EU Member States is allowed). The validity of the Certificate Of Conformity (COC), is therefore not limited to specific European countries which apply English as their official local language (e.g. UK, Ireland). Although the local authorities may request a translation of the Certificate Of Conformity (COC) in their own language, the Certificates Of Conformity (COC) itself has to be accepted in any language applied in the EU. Deliverables can be uploaded by applicant during the on-line ordering proccess or alternatively send by fax to +31 (0) 84 7385677. It is also possible to send the deliverables at a later stage. You will have to log in to your account , choose the relevant order und upload the required documents. Please ensure that all scans and/or pictures are showing visible and readable information. In case the dropdown menu below has not been filled in yet, we kindly ask you to fill it in with the correct vehicle data to add the document to your cart. 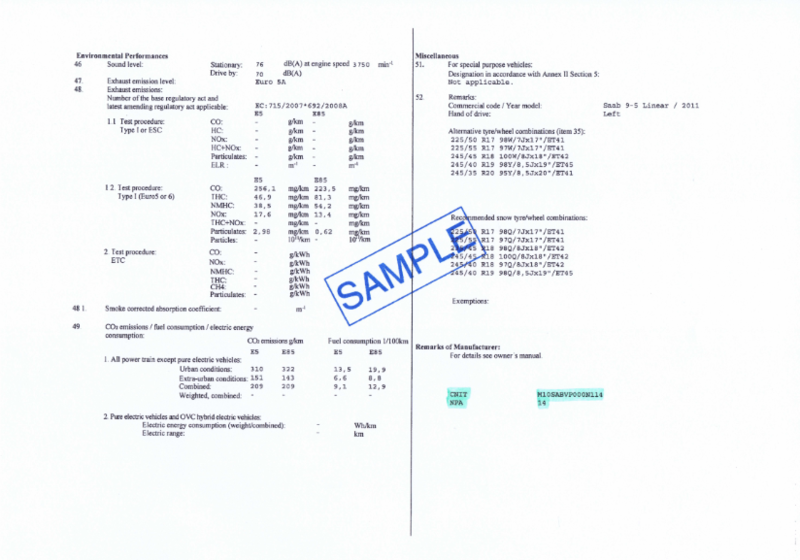 The documents provided by VDOCS are genuine and issued by the vehicle manufacturer or their Europeran representative. Payment and personal information is 100% secure using a SSL certificate.